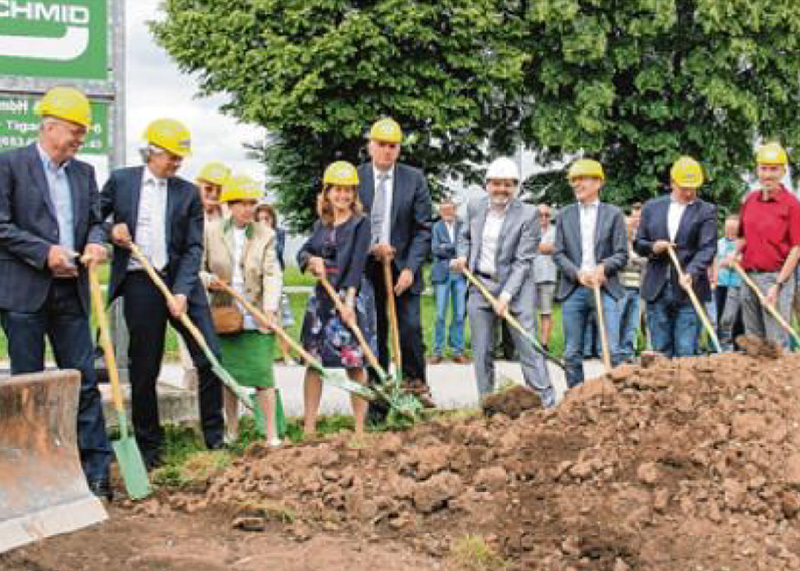 NIEHOFF Schwabach - NIEHOFF is expanding its activities into larger rotating equipment for stranding wires and cables with bigger cross sections. NIEHOFF is expanding its activities into larger rotating equipment for stranding wires and cables with bigger cross sections. 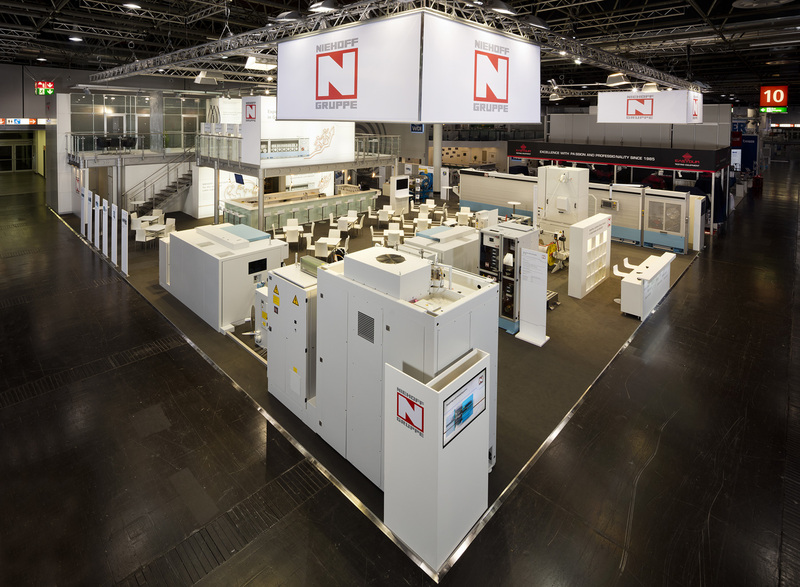 NIEHOFF has been active in designing and building rotating machines for the cable industry since the 1960s. Typical machines resulting from this continuous development are the renowned double twist stranding machines of the D and DSI series. In order to enable NIEHOFF customers the production of energy cables with even larger dimensions, NIEHOFF started in 2017 the development of three further D series machines for spool sizes up to 2000 m as well as rigid stranders. The design of these machines is carried out through a collaboration between the engineers of NST (NIEHOFF Stranding Technology S.L.) and the engineers at NIEHOFF’s headquarters in Schwabach (NSC). The specialists of both teams have extensive experience in the design of rotating machines for the cable production. Until recently, the D series of double twist bunching and stranding machines comprised seven differently sized models built in right- hand or left-hand version. The new double twist stranding machines of the D series with the designations D 1252, D 1602and D 2002 are mainly foreseen for the manufacture of conductors for energy cables with 6 mm2 to 500 mm2 cross sections. The first machine which has been designed is the D 1252 model which will be built in 2018 and is a consistent further development of the D 1251. The D 1602, the next larger model, will be intended for conductors with a 19 wire design, and the D 2002 for all designs beyond (Fig. 1). In parallel to this development, the peripheral machinery is going to be developed. Like all machines of the D series, the new D type machines feature the contactless transmission of machine data within the machine and the service proven energysaving single bow design and are equipped with an energy-class IE3 energy saving rotor drive and an adjustable fan drive in the sound proof cabin. A smooth conductor treatment is ensured by the fact that all pulleys and capstans have big diameters. The automatic traverse is equipped with a flange detection system allowing spools to be perfectly wound. Even at high speeds, spooled wires can be payed-off tangle-free and with no damage. Several sensors monitor the quality of the production process. Due to the design, there is a straight conductor path from the second twist pulley to the haul-off capstan enhancing the quality of the wires which can be compacted via a motorized closing/compacting die with die lubrication. For all range of machines the working height is 1300 mm. Also the new D type machines are operated using a network-compatible Human Machine Interface (HMI) color touchscreen monitor called NMI (NIEHOFF Machine Interface). While stranding in unilay construction can be realized in most cases by a double twist strander, other concentric constructions, which normally involve more wires, require machines such as rigid stranders. These machines are used for the manufacture of concen- tric cable constructions such as 1+6+12+18+24+... allowing cross lay formations. The machines consist of several cages which contain a certain number of radially disposed bobbins (6, 12, 18, 24 ...). 6 Cages (6+12+18+24+30+36) for up to 127 wires. 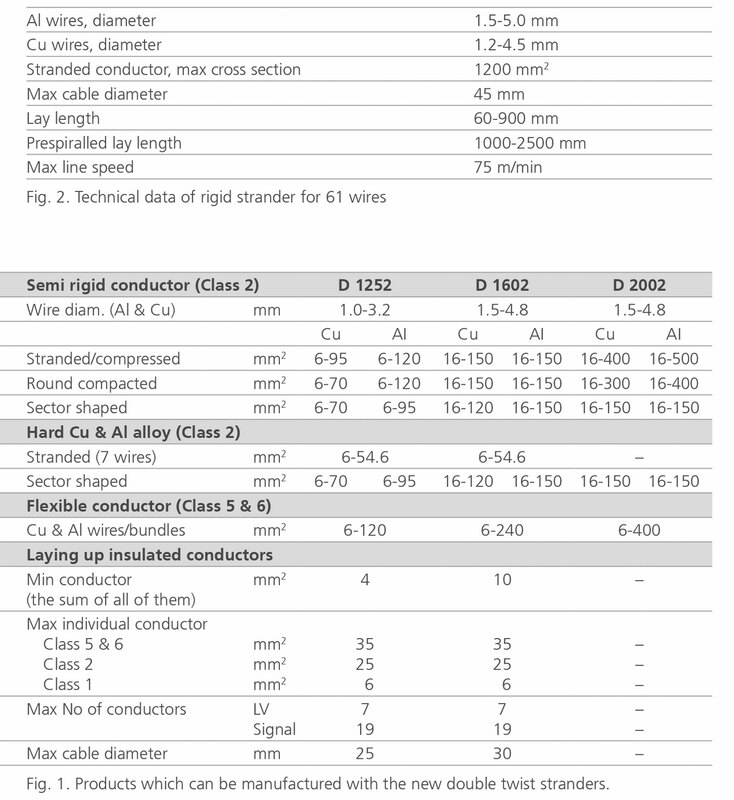 The most demanded configuration on the market is the rigid strander for 61 wires (Fig. 2) followed at big distance by the 37 wires configura- tion. Each cage rotates on its axis independently from the other cages in speed and direction. The bobbins are hold by pintles allowing the paying-off rotation. The bobbin sizes are normally 630 mm. A big pulling capstan is in charge of pulling the stranded conductors, a take up is winding the conductor. Rigid stranders can be used for the manufacture of a wide range of cables such as round stranded, round compacted, round with trapezoidal wires, round with Z shaped wires, straight sector shaped, prespiralled or ACSR conductors. The machines can be used also for laying up control cables and applying a screening with Cu or Al wires.